I am a 23 year old collector of coins, civil War tokens, and currency. I began collecting when I was 13. Like most collectors I began collecting modern cents, nickels, dimes, Morgan Silver Dollars, paper money, and everything else! I came to realize early on that I needed to educate myself in every way possible. After graduating high school in 2002, I took the A.N.A.’s correspondence courses in coin grading, counterfeit detection, and other important areas. I also subscribed to all the coin and currency publications I could find, receiving six or seven different ones! I read great articles from authors such as Q. David Bowers who recommend specializing in one or two areas. I had always had an interest in the American Civil War, so collecting Civil War era currency was a natural choice. I also discovered obsolete and national bank notes from my area, Utica, MI. These are quite rare, but I managed to find a few from Dr. Wallace Lee. Now I was 19 years old and well on my way to being a serious Numismatist. In order to afford my new specialties in Confederate currency, Civil War Tokens, and regular issues of coinage from 1861-1865, I would need to sell some of my accumulation. I had sold some of my coins to local dealers, and even mailed some off to dealers out of state. But I realized that if I could sell direct to the public, I would make more money. So I reserved a table at the next local show. I was now a dealer, or so I thought. I had not realized all the cost involved with being a dealer. I first had business cards made, $50. I called myself Sheffer’s Coin and Currency. Then I bought show cases, lights, table fees of about $40 at that time, and gas to get there. After a few months I had enough and went back to being a collector. In 2006 I again tried being a dealer. I had met a lot more dealers, and closely watched how they conducted business. I had also joined several local and national clubs, and this put me in contact with potential customers. I once again had business cards made, and even registered as a business with the county. This time I went by Daniel’s Coins and Currency. I began buying coins and currency to resell. I started selling on eBay, and sold at local shows. I did quite well. I had started working as a temporary clerk at the Post Office in the fall of 2006, but knew this would not last. I had to turn coin dealing into a full time career. The Post Office would be my source of income until I got the business going. People often ask what got me started collecting. There really is no clear cut answer. I had a few odd coins given to me when I was young. My older brother dabbled in coins before I got into it. But stories about my Great Grandfather, Ernest Hack (born Ernest Polczynski, son of Joseph and Valeria (Pyszora) Polczynski of Detroit, in 1889) really sparked my imagination. In 1900, at the age of 11 he began collecting coins, bank notes, and stamps. His main passion was obsolete bank notes, of which he had thousands by the late 1950’s. He passed away in 1971, before I was born, but my father would tell me about him. One of the first stories I recall is how my Great Grandfather had given my dad (Ernest’s grandson), an 1881 three cent nickel. I knew a “nickel” was worth five cents, but a three cent nickel? What is that? My father was also given an old book from Ernest, it turns out it is a 1947, first edition “Red Book” worth a few hundred dollars today! 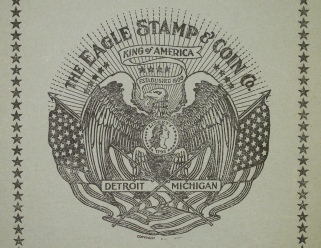 I also learned that he issued a retail catalog with stamps and coins for sale. Learning about him helped to inspire me to pursue my dream of being a rare coin dealer. And in January 2007 I did just that. I found a small office, formed an LLC., and yes, had new business cards printed! I was now the proud owner of a real business, Daniel’s Coins and Currency, LLC. I must take a moment to thank my parents, and all of my great friends in numismatics that supported me in my decision to open an office, and continue to support me. I could not do it without you! I was blessed from the beginning. I made my first sale in the office on January 31, 2007 only 15 days after moving in. The sale was over $2,000! In June of 2007, I left the Post Office to pursue coin dealing full time, and have not looked back since. The super rare 1861 Confederate notes cost around $20! In all there are 33 pages of stamps, coins from all around the world, currency, and Civil War bullets. I wish I could own these coins and currency at these prices! On the back cover of the catalog is his company logo. I took it to a print shop and had the information changed to my company information, for my company logo. I’m sure he would be proud to know that 90 years after he issued his catalog, his great grandson would start a business and use the same logo, with minor changes. I am lucky to have these items that have been passed down from him: A 1947 Red Book, a metal coin cabinet, 1798 large cent, the 1881 three cent piece, low grade, common date wheat cents, Liberty nickels, Morgan Silver Dollars, and a 1914-D $2.50 gold piece. The quarter eagle is from the year my grandmother was born, and has been in the family since it was new. The funny thing about this coin is, had my Great Grandfather bought her an uncirculated roll of 1914 buffalo nickels, which cost $2 rather than $2.50, the roll would be worth at least $2,400 (1914-P in MS 60 at $60 per coin, times 40 coins). The quarter eagle is currently worth about $425. I continue to do further research on Ernest and his establishment. Learning about my Great Grandfather’s business, from almost a century ago, inspires me today. 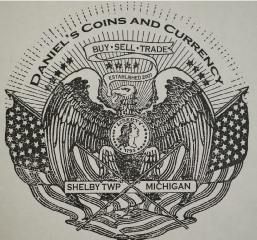 This is family history, numismatic history, Michigan history. Do you have a numismatist in your family? Research them!